Hi everyone, I hope you have had a wonderful Christmas and New Year. We saw the New Year in by celebrating down on the foreshore and watching fireworks over the bay. It was awesome to catch up with friends. One of my friends has a goat which she milks each day … and has learnt to make goat’s milk feta cheese. It was very more-ish!!! I’ve never milked a goat so I think it might be kind of cool to have a go at it. In the meantime, Rubber Dance usually have 2 challenges on each month – a colour challenge, and a themed challenge. Starting this year the two challenges will run together as one challenge and go for the whole month. You choose which one you would like to do! Either colour, or theme. The colours for January are Purple, Blue and Olive Green. The Theme for January is VINTAGE. I chose to follow the colour challenge. My inspiration uses: Face-Up, Affirmations, Antique Botannicals, Crazy Flowers #2, Old Book Page and Round In Circles. The background for my tag is a play with Dina Wakely acrylic paints – I just love the colours in this range. Some stenciling and stamping. And now I have another tag to add to my tag book! 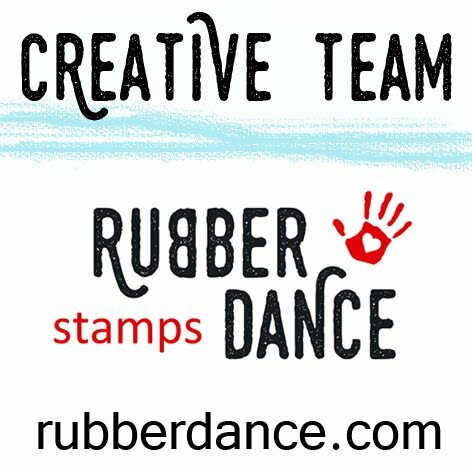 The Design Team has some amazing inspiration for you over on the Rubber Dance blog, so please pop over and take a look and join in the fun. Bibi, the owner of Rubber Dance, is offering 12 Euro to spend at Rubber Dance to a randomly picked winner at the end of the month. And if you would like to spend a little on yourself in the meantime, you are welcome to use the code DLFreeShip as the coupon code at the check-out, you’ll receive free postage on your orders. Anytime, all the time, for everyone! Go Where Your Muse Takes You.